Xavier Martinez (1869-1943) was an artist whose colorful personality stood in dramatic contrast to his paintings, which were quiet, poetic evocations of the natural world bathed in muted light. He was an eccentric character who often dressed in old corduroys tied at the waist with a sash, a brilliant blue shirt and a contrasting red tie. With his inky back hair falling across his face in a clump, even his self-portraits look like a caricature of some denizen of a bohemian paradise. 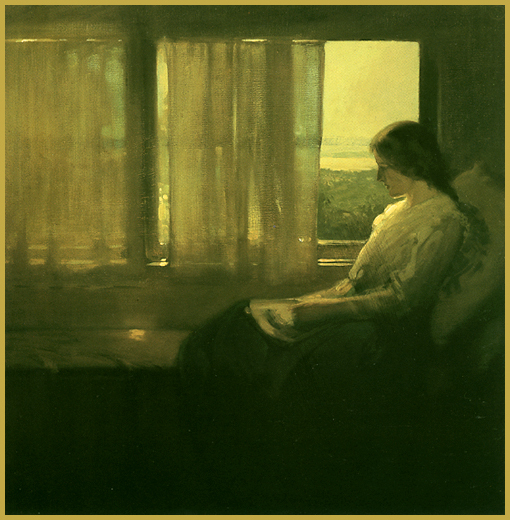 While his personality did draw attention, Martinez was an important painter and teacher who adopted the melancholy palette and simplified compositional structure of Tonalism early in his career and stayed true to it for fifty years. Xavier Martinez was actually born in Guadalajara in 1869 with the wordy name of Javier Timoteo Martinez y Orozco, to a Mexican father and a Spanish mother. He eventually changed his name to Xavier Tizoc Martinez with a middle name that honored his Mexican Indian heritage. Martinez was an artistically talented young man and he began his education at the Liceo de Varones in Guadalajara. His mother died when he was seventeen and he was taken in by a high-born woman named Rosalia LaBastida de Coney (1844-1997), married to an American, Alexander K. Coney (1847-1930) who worked for Mexico’s foreign office. The Coneys came to believe in the artistic young man and when Alexander Coney was appointed Consul-General of Mexico and posted to in San Francisco in 1886, Martinez followed them, sailing through the Golden Gate in 1893. Beginning in 1894, Mrs. Coney sponsored his education at the California School of Design with the well-known instructors Arthur K. Matthews, Amedee Joullin (1862-1917) and Raymond Dab Yelland. Although the young artist was already a well-read man, he spoke French as a second language but no English and so he had a difficult period of adjustment at the art school. Arthur Matthews, the most impatient and irascible of teachers, thought Martinez should give up art and recommended that he be sent somewhere he “…might learn to be fit to paint carriages.” Fortunately, the Mexican artist persevered and as he learned English and the practice of drawing and painting, his promise became evident to all. In 1895 Martinez won the Avery Gold Medal for Painting at the School of Design as well as an Honorable Mention for Drawing. He sketched along the Monterey coast for the first time in the summer of ‘95 and exhibited “Twilight, Monterey Bay” at the San Francisco Art Association’s Winter Exhibition. The next spring Martinez exhibited eight works, including four from the peninsula. In the winter of 1896 the Mayor of San Francisco purchased a symbolic work “Offering to Chac-mol, God of Fire of Aztecs,” which marked the young artist as a man to watch. 1897 was a busy year: he graduated from the California School of Design, was invited to join the Bohemian Club and was awarded a scholarship to study in Paris. In Paris Martinez won admission to the Ecole des Beaux Arts – which was free to any artist who could earn a spot through the difficult “Concours du Place” – where he studied under the academic master Jean Leon Gerome (1824-1904). The eccentric young painter threw himself into the Bohemian scene of theLatin Qorner while he worked diligently. In 1900 Martinez attended the Academie Carriere with Eugene Carierre (1849-1906), painter of smokey and mysterious figurative works and managed to win an Honorable Mention at the Exposition Universelle, the Paris Worlds Fair. In Europe he came under the spell of early Spanish painting, discovered the Post-Impressionist and Nabi painters and adopted not only Whistler’s methods but his “art for arts sake” ideals. 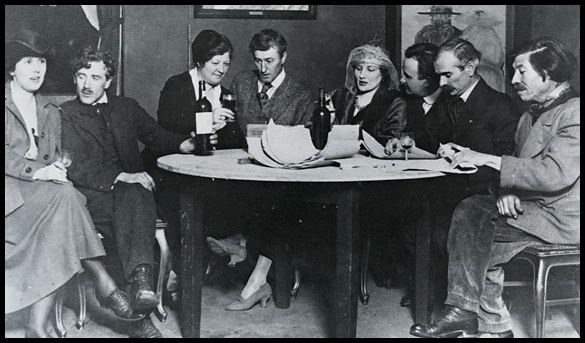 When Martinez returned to San Francisco in 1901 he took a studio on the “Montgomery Block” where many artists had spaces and helped to recreate the life of Bohemian Paris that revolved around the Coppa Restaurant where artists and writers ate, drank and argued about art. He made many painting trips to Monterey and the darkly lyrical views of trees in golden hues that he painted after his trips there became his iconic works. A volatile but social man, Martinez traveled often, usually in the company of artist friends like Maynard Dixon, with whom he ventured to Mexico in 1904, Maurice Del Mue (1875-1955 ) or Peter Neilson (1867-1937). Like most of the San Francisco painters, Martinez lost his studio in the 1906 Earthquake and the conflagration that followed. With the city in ruins, he moved to the east bay town of Piedmont to live with his friend, the writer Herman Whitaker. Martinez the house guest fell for Whitaker’s winsome daughter Elsie who was almost twenty years younger than the dashing painter and after waiting for her 18th birthday, they were married. The new couple honeymooned in Carmel and then moved into a house and studio in Piedmont that was finished with funds that the eastern painter Arthur B. Davies sent Martinez to help him after the earthquake. In 1902, Martinez was instrumental in founding the California Society of Artists, a more adventurous organization that broke away from the San Francisco Art Association. In 1909 he began teaching at the California School of Arts and Crafts where he became a popular instructor known for his high standards. The Martinez home in Piedmont became salon on Sundays for artists, writers and photographers. In 1913 he went to Arizona with Francis McComas, which was to become a popular subject for both artists, and his only child, Micaela, was born. Martinez taught summer classes on the Monterey peninsula from 1909 to 1914, and exhibited his monotype prints at the Panama-Pacific International Exposition in 1915. He kept teaching and working, painting his simplified landscapes in the hills of east bay, Marin County, on the Monterey coast and Carmel Valley. Throughout his long career he kept the same methods and ideals, even though the art scene had long since moved in new directions. After he and his wife divorced they remained close, and he spent his last months with her in Carmel, where she had moved. Copyright, 2009-2011, Jeffrey Morseburg, not to be reproduced without the specific written permission of the author. Have a Martinez Painting You Need Evaluated or Appraised? 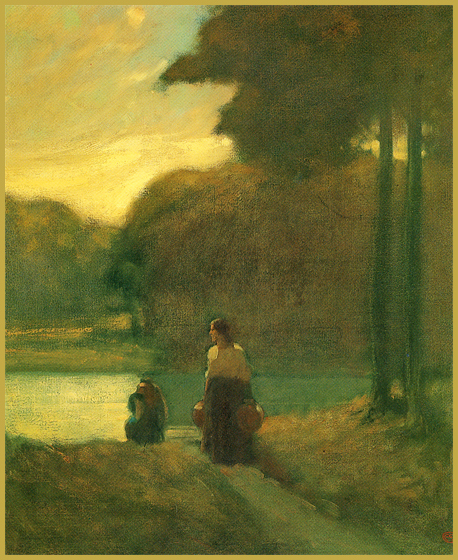 This entry was posted on 08/06/2011, 03:28 and is filed under Northern California Tonalism, Plein-Air Painters of the North, San Francisco Art Association, San Fransico Artists. You can follow any responses to this entry through RSS 2.0. You can leave a response, or trackback from your own site. Wow, great post! Such good incite into an artist that is often overlooked. You are right, his muted images are beautiful and poetic. I think this artist is one of the most unique painters from Mexico and I am so happy to see other recognize his work. I have re-blogged this over at http://mexicoart.org. Please stop by or leave a comment!